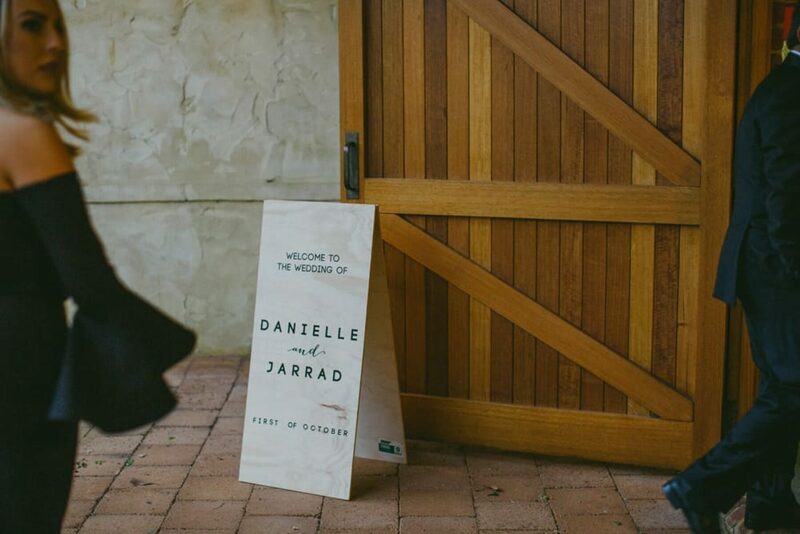 As inconvenient as it is, they say that rain on your wedding day brings good fortune, so Danielle and Jarrad are in for a lifetime of luck. 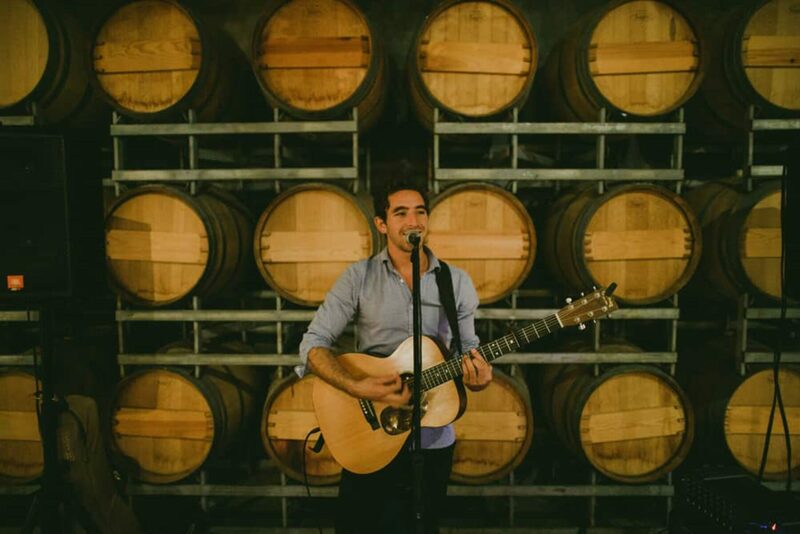 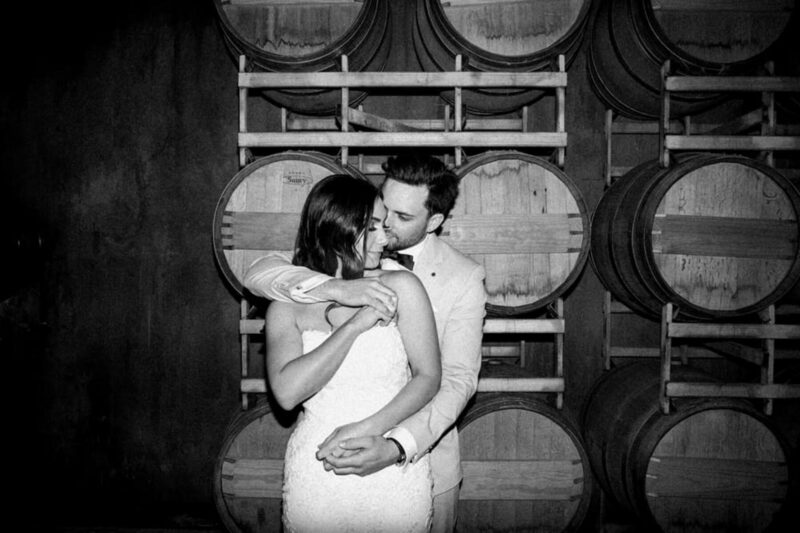 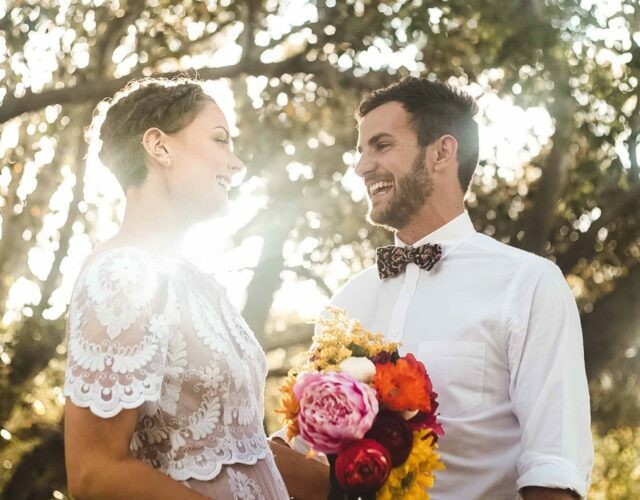 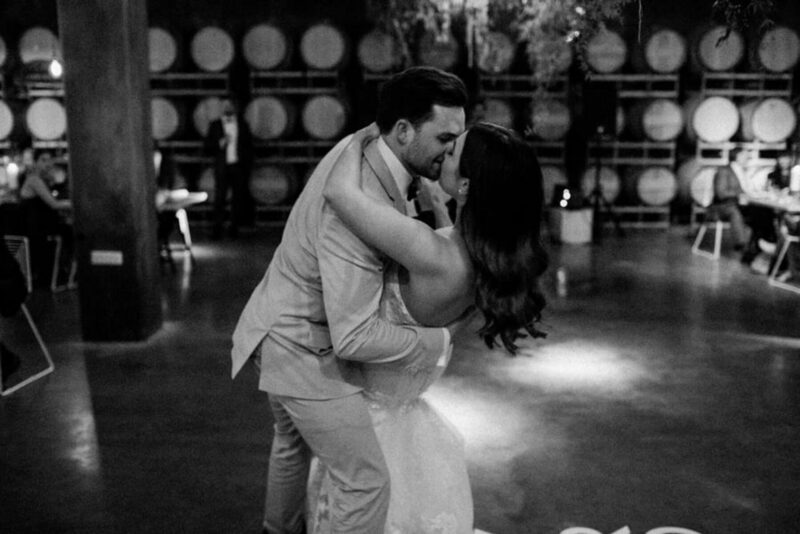 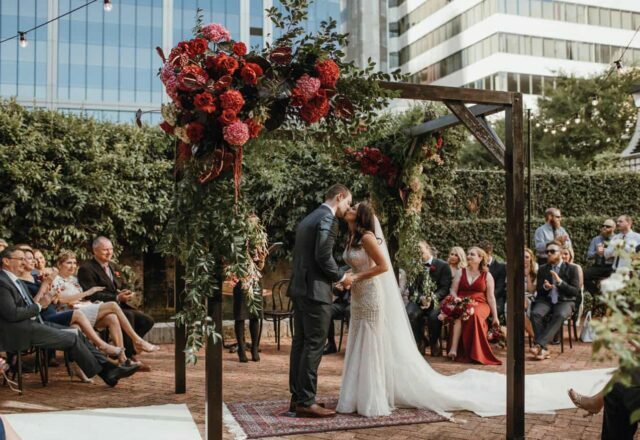 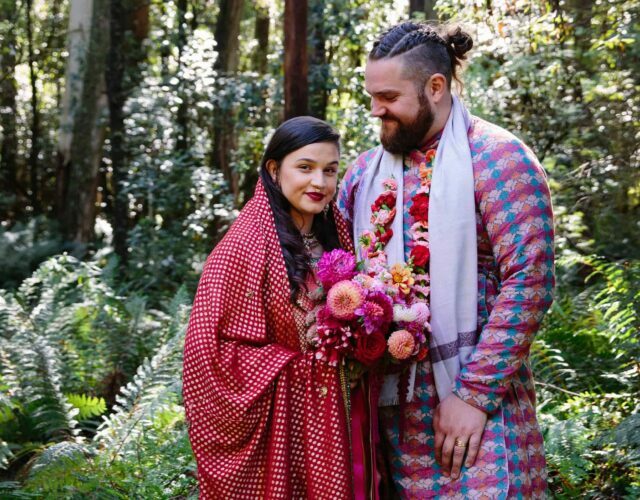 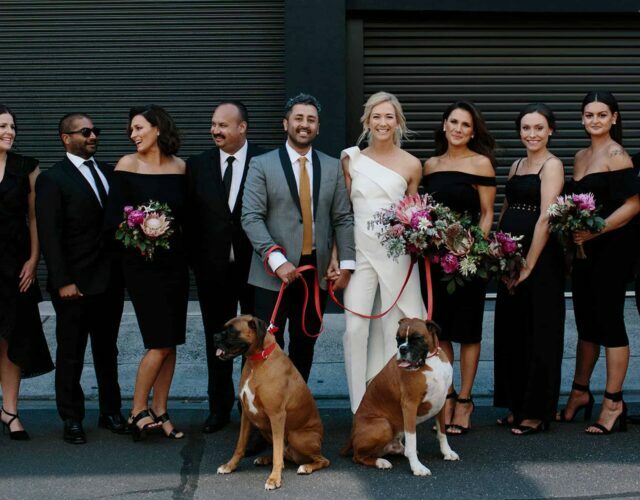 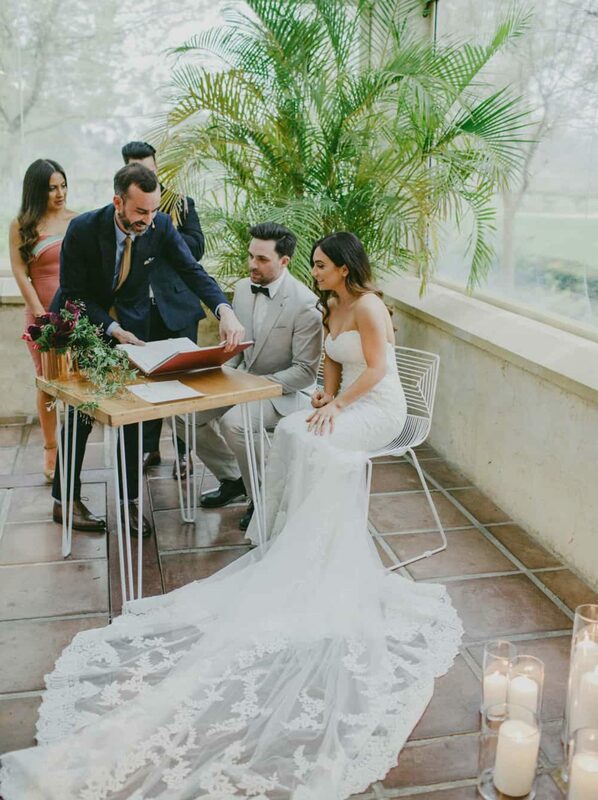 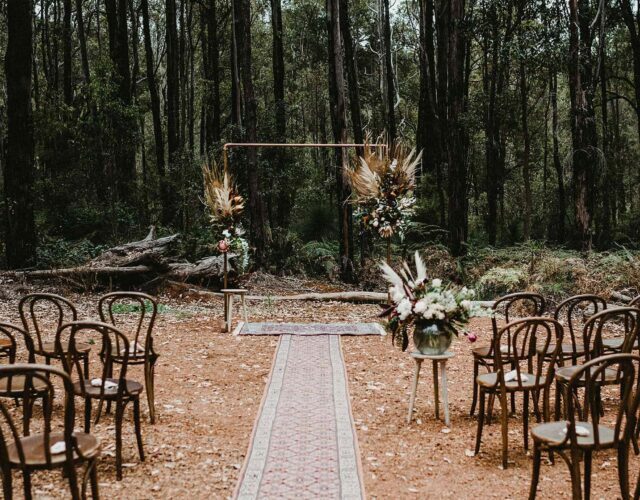 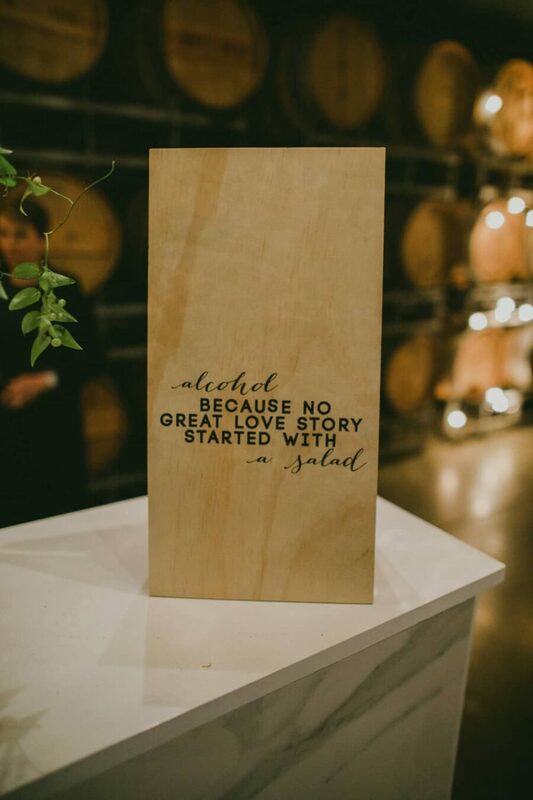 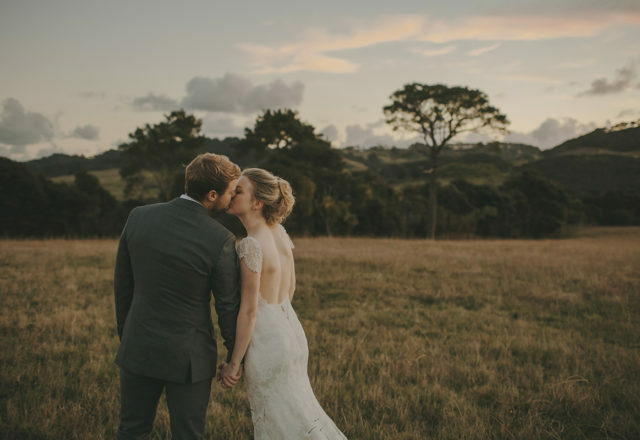 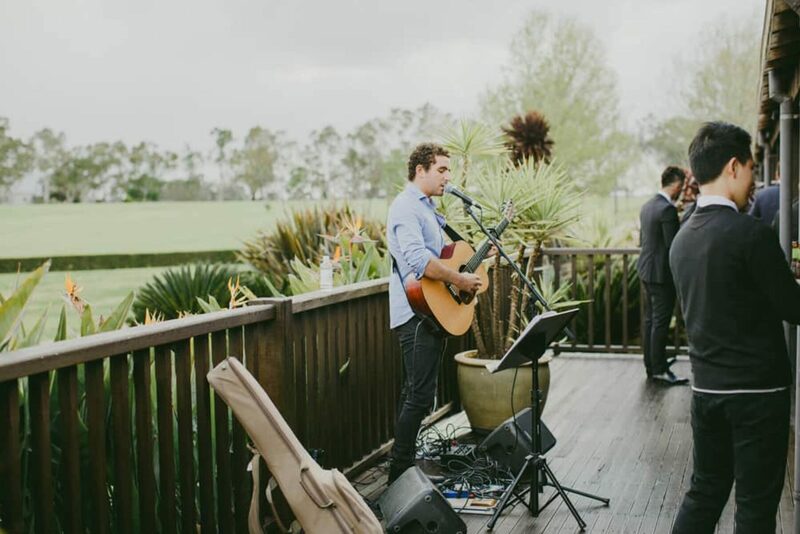 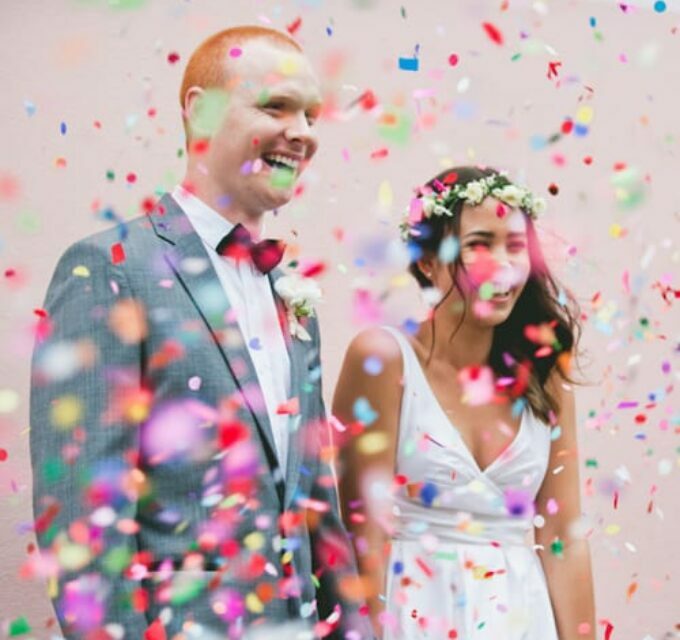 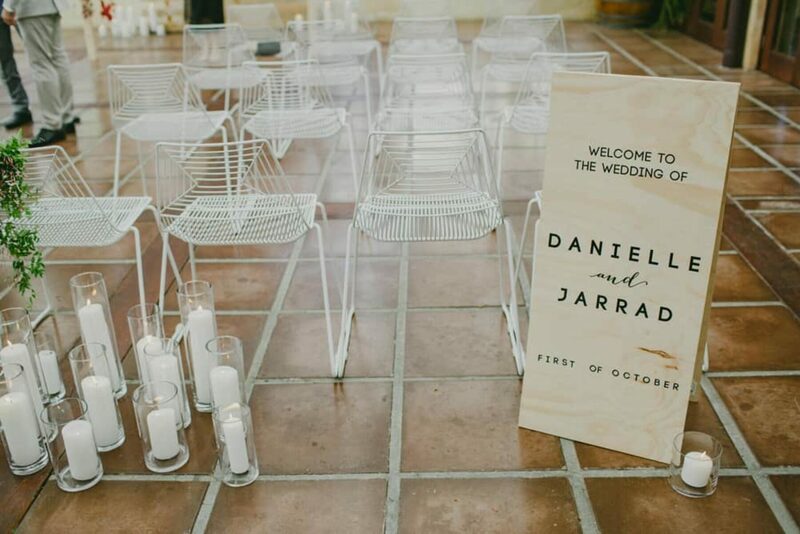 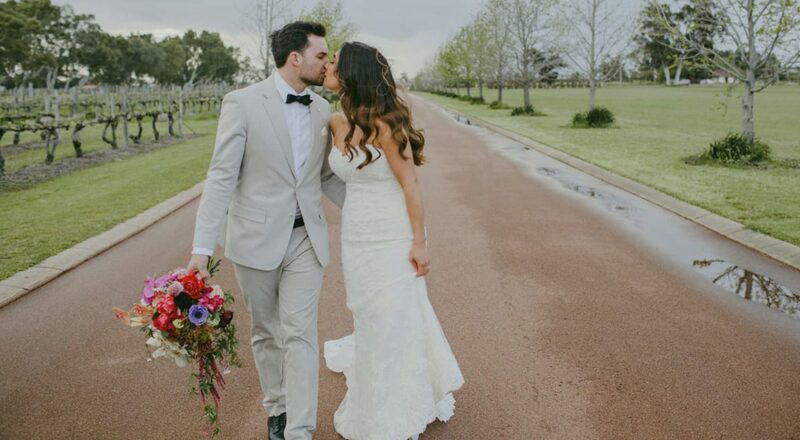 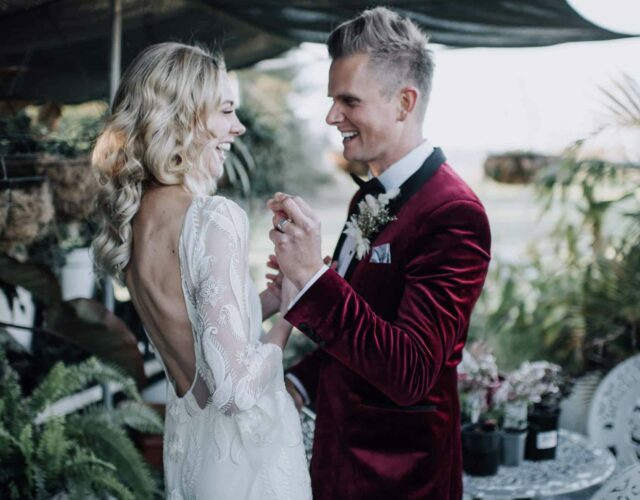 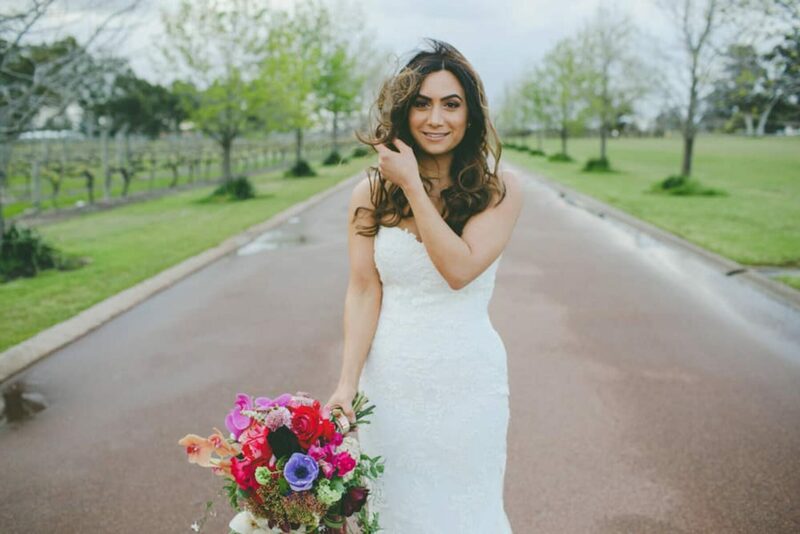 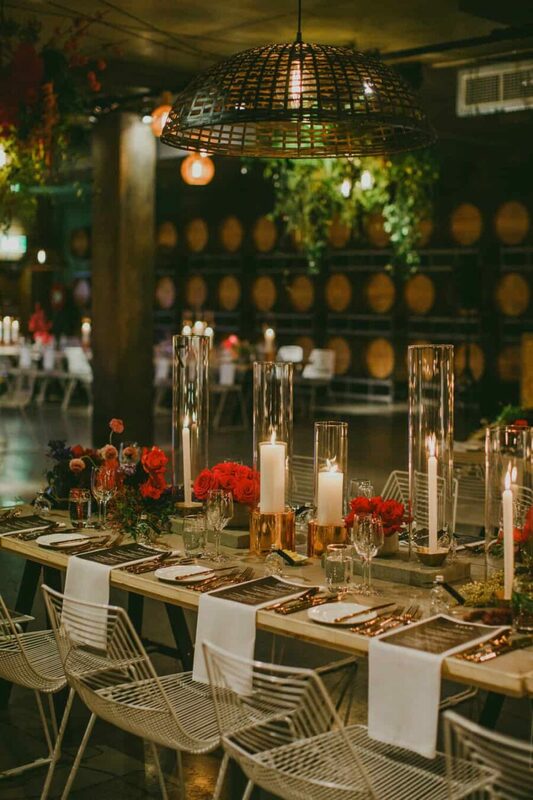 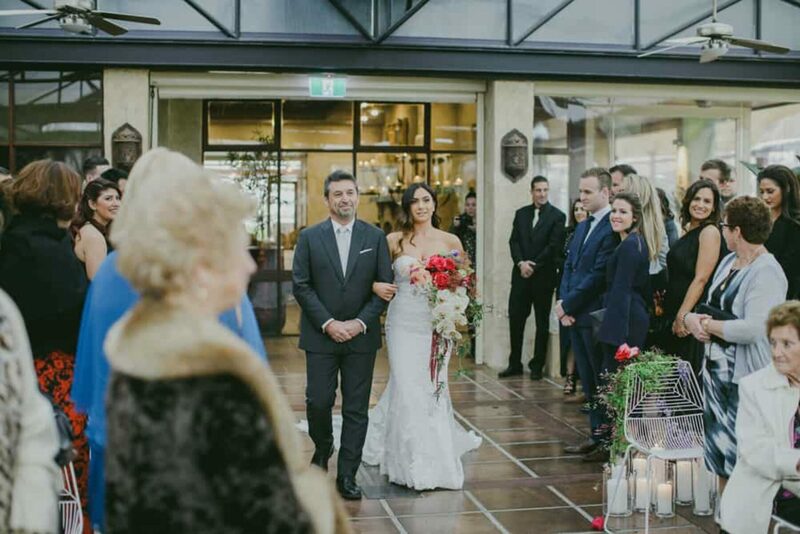 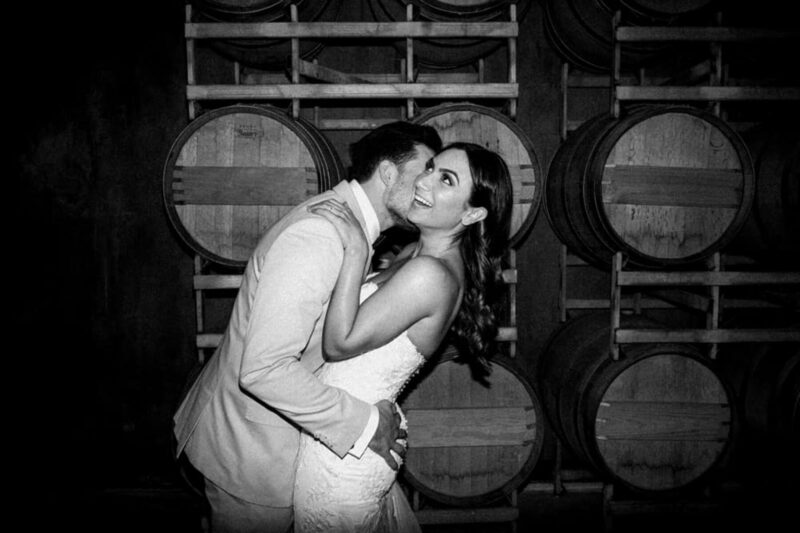 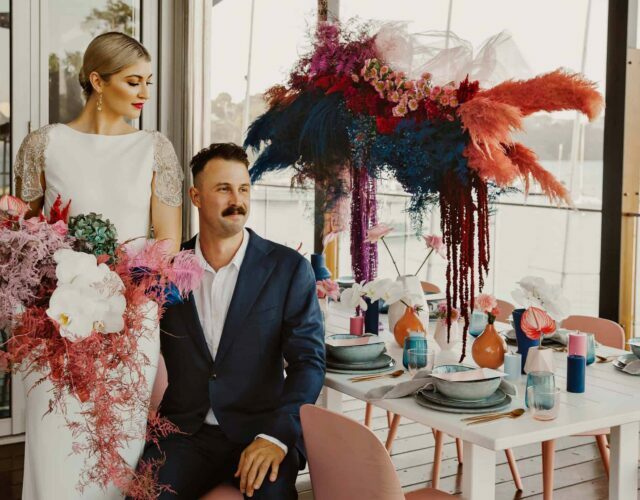 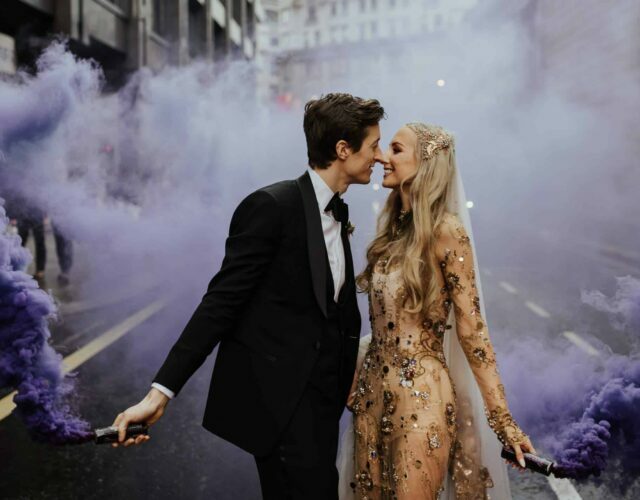 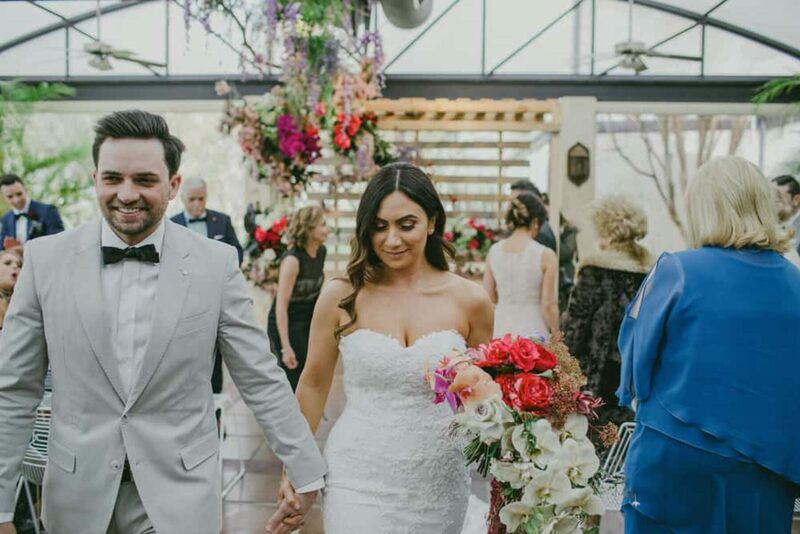 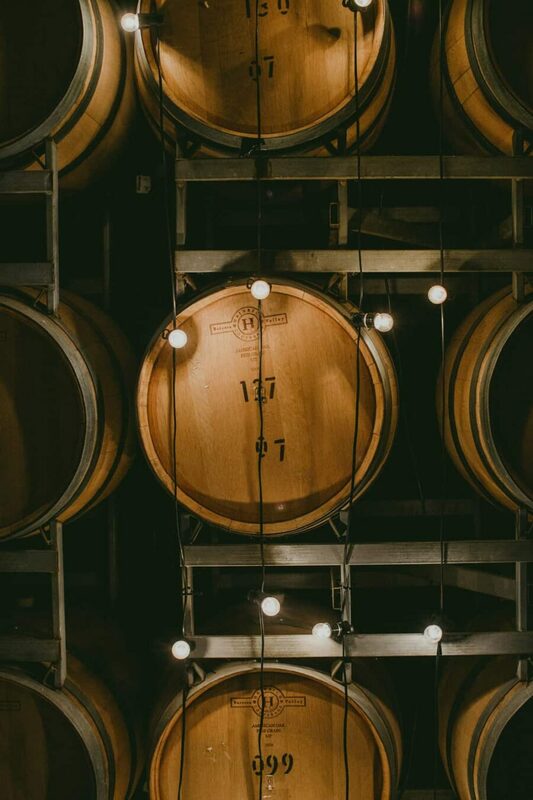 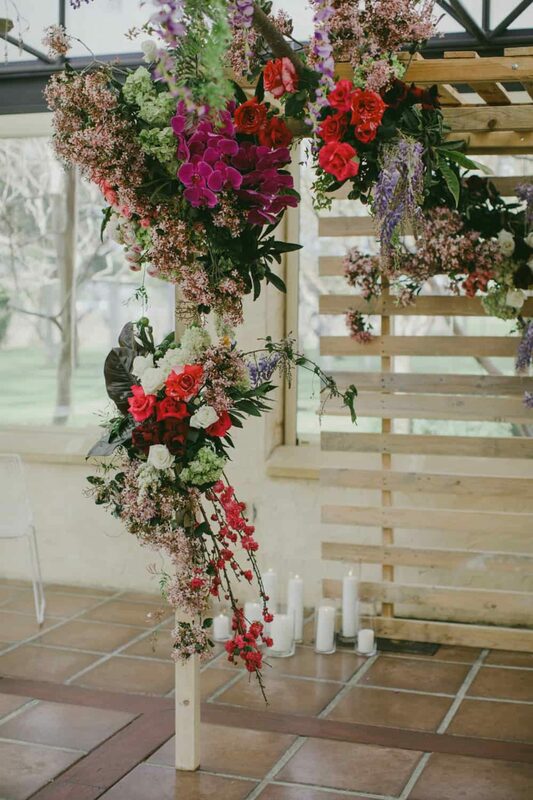 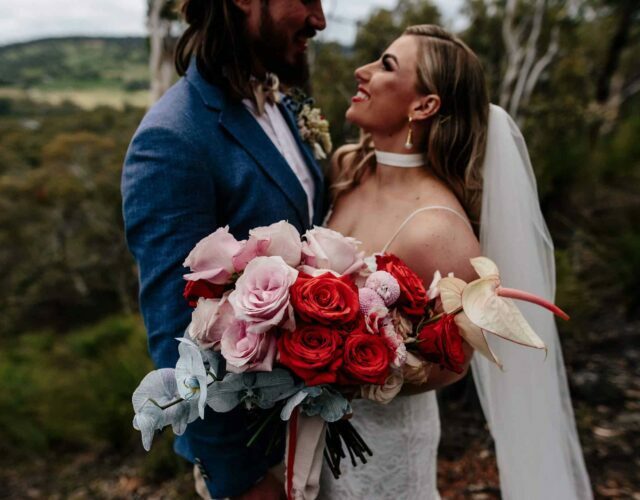 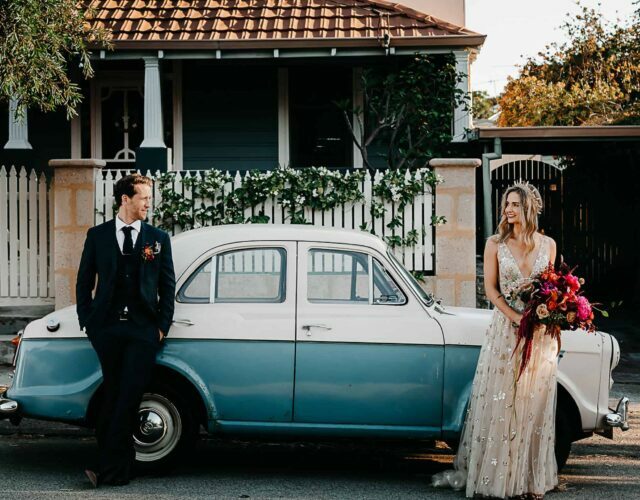 Their big day saw the most rainfall for all of October, but that didn’t stop them – they tied the knot in the Element Room at Swan Valley’s Sandalford Winery and despite not being the outdoor ceremony they’d hoped for, Natasja Kremers pics are proof it was a damn good day. 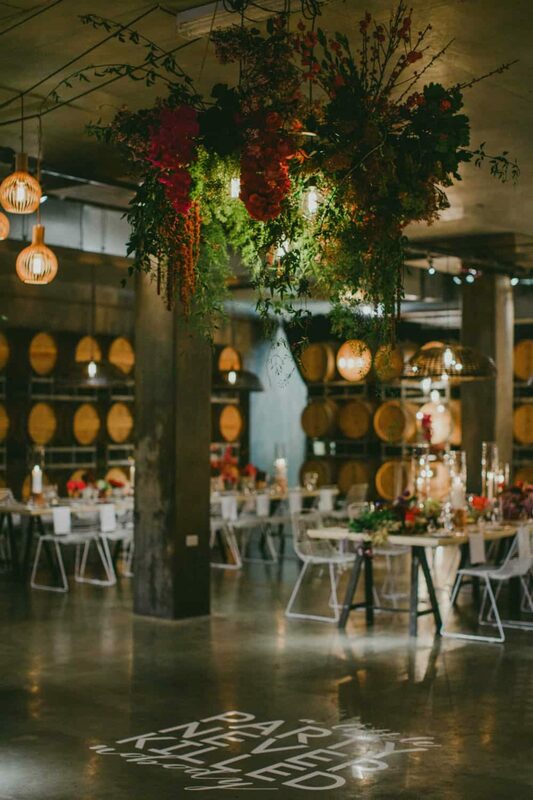 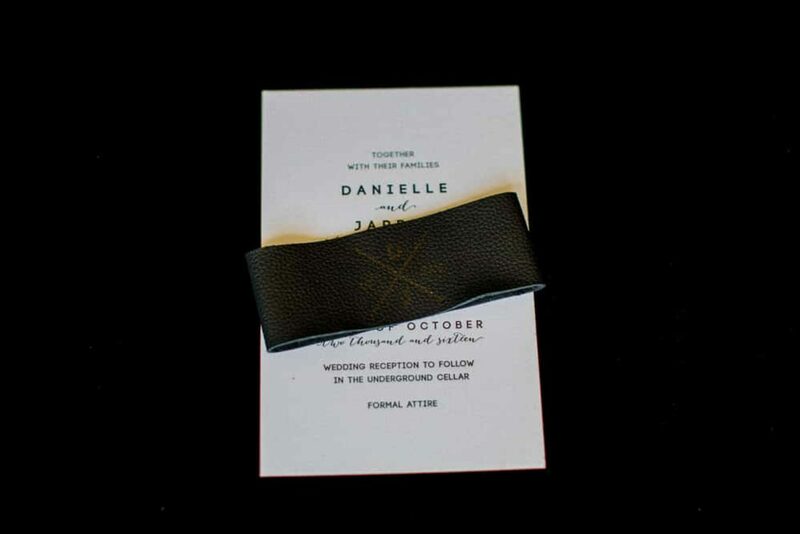 “We loved the beautiful grounds of Sandalford and the blank canvas reception room which is the underground cellar,” says Danielle. 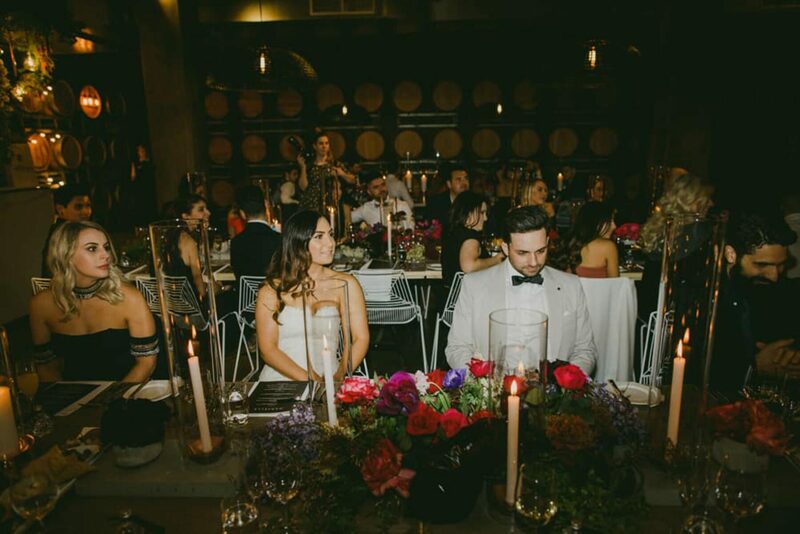 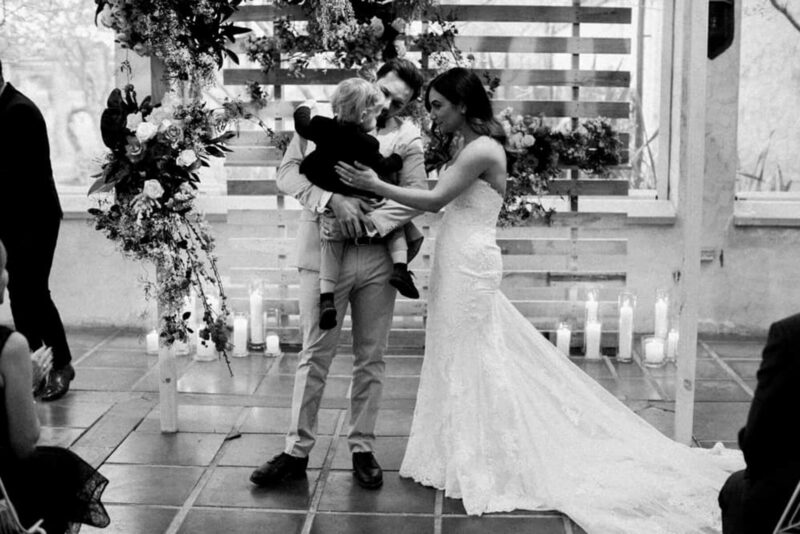 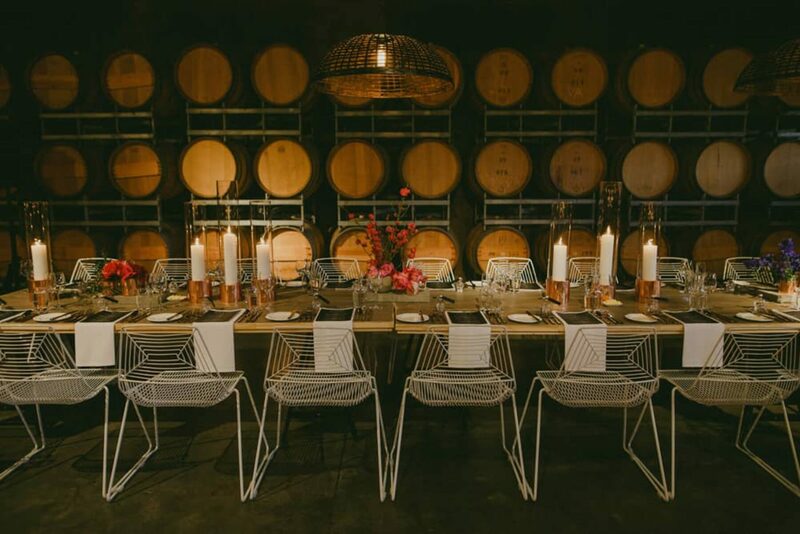 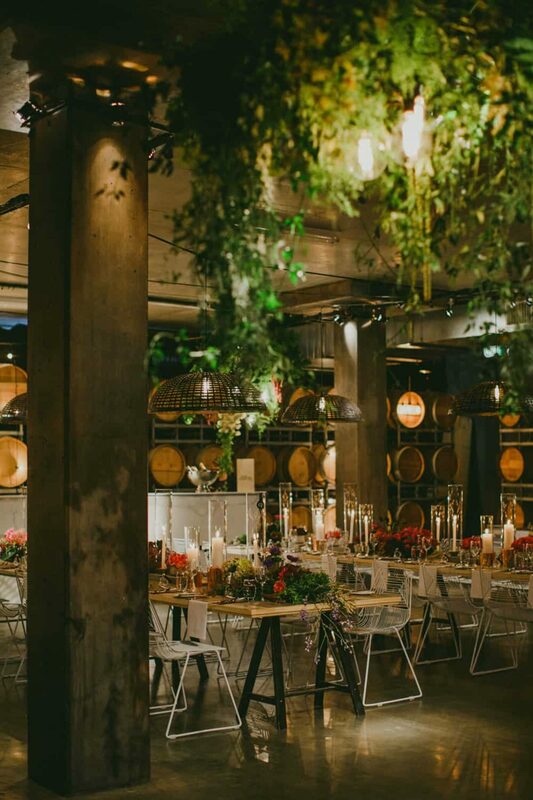 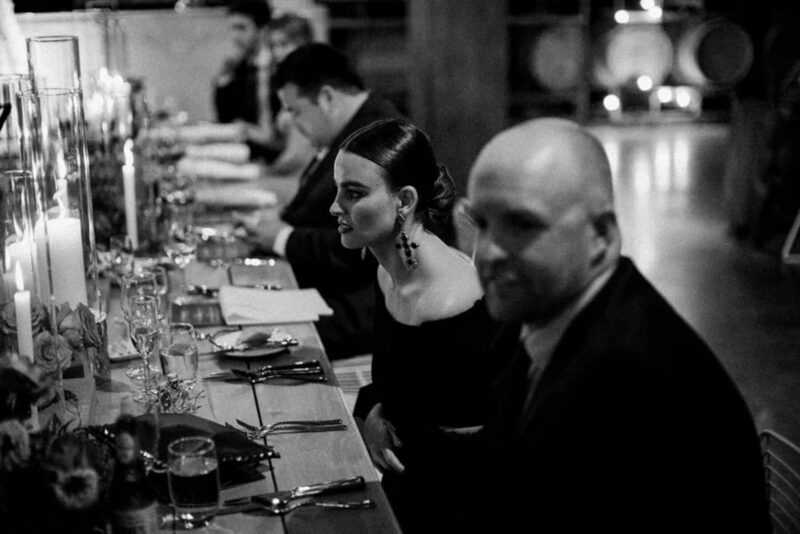 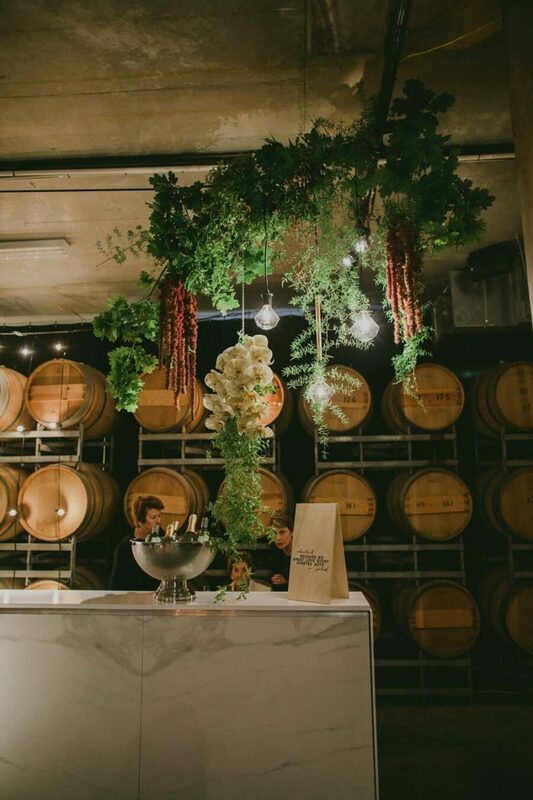 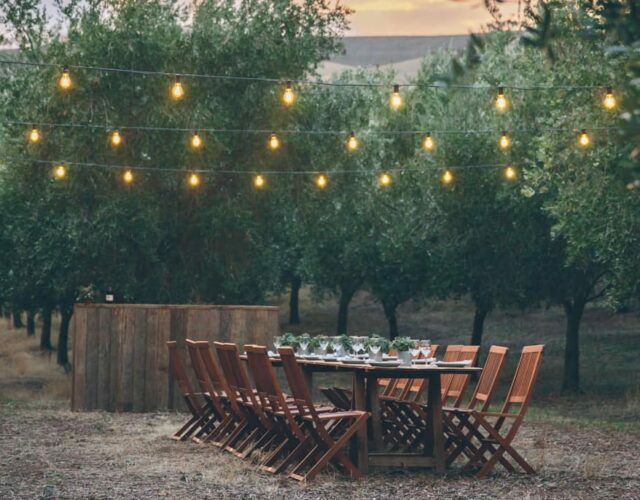 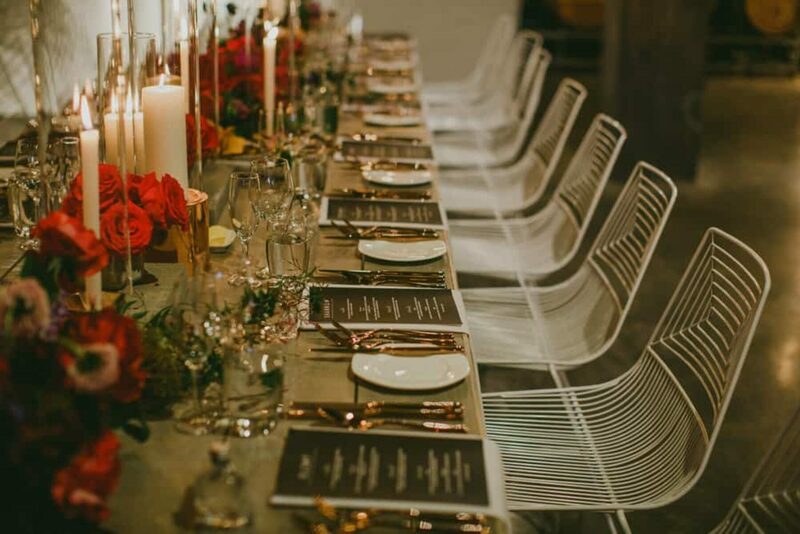 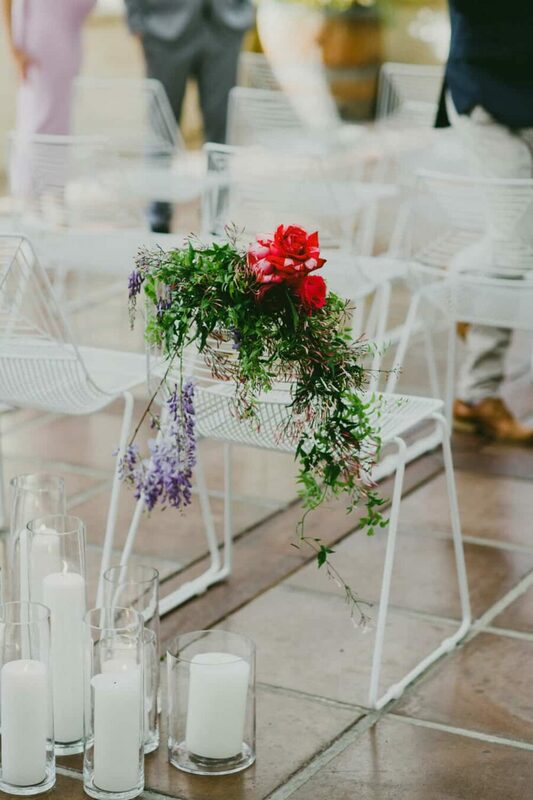 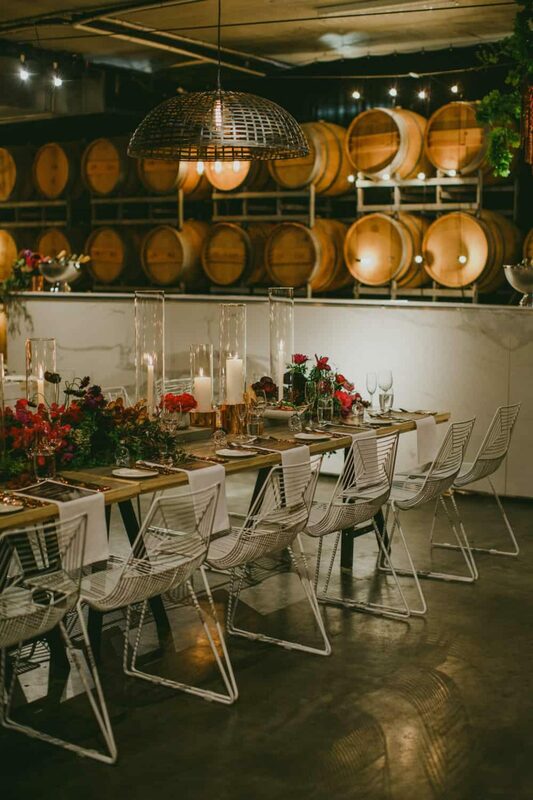 “The theme was modern, bright blooms, warm timbers and pops of black and white.” Jess of Butcher Baker Stylist Creator earned rave reviews for her resourcefulness in the face of unpredictable weather and her setup, along with the blooms by Natural Art Flowers made for a stunning setting. 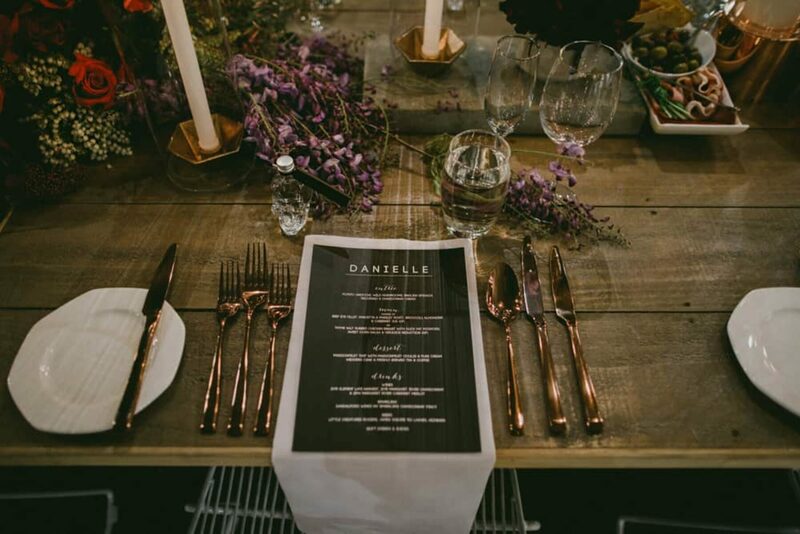 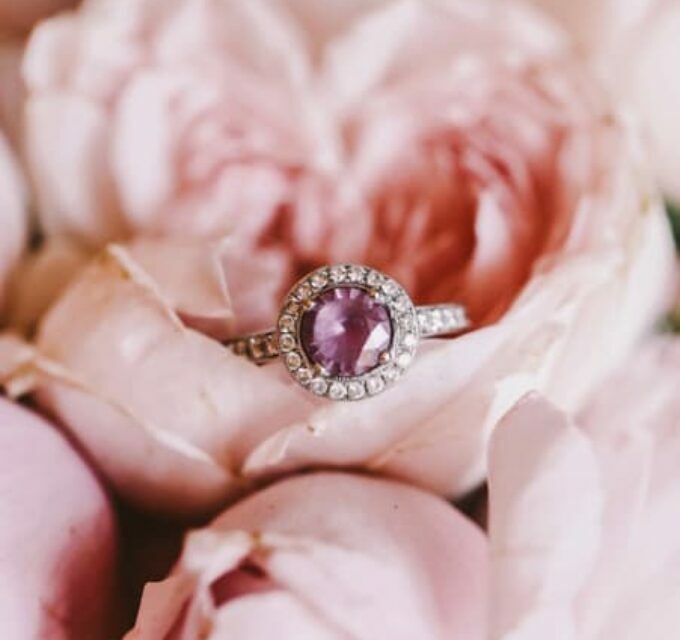 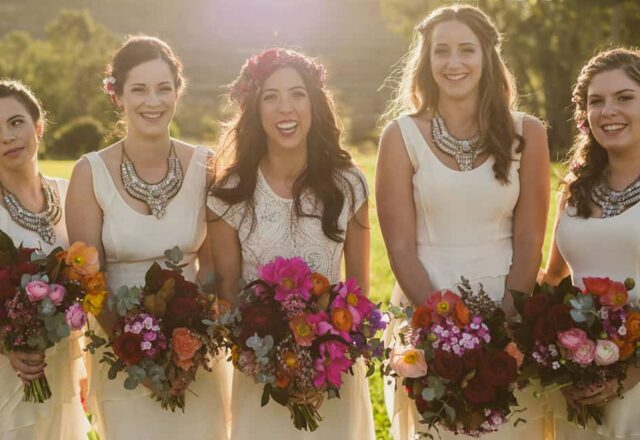 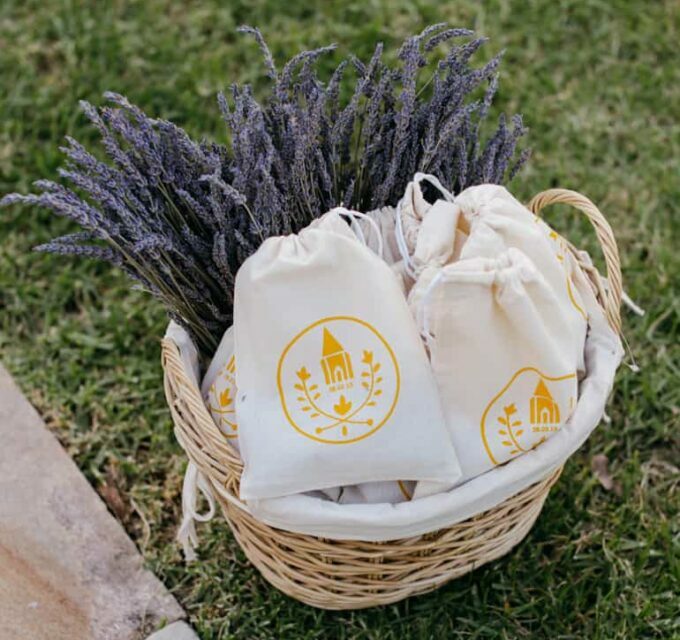 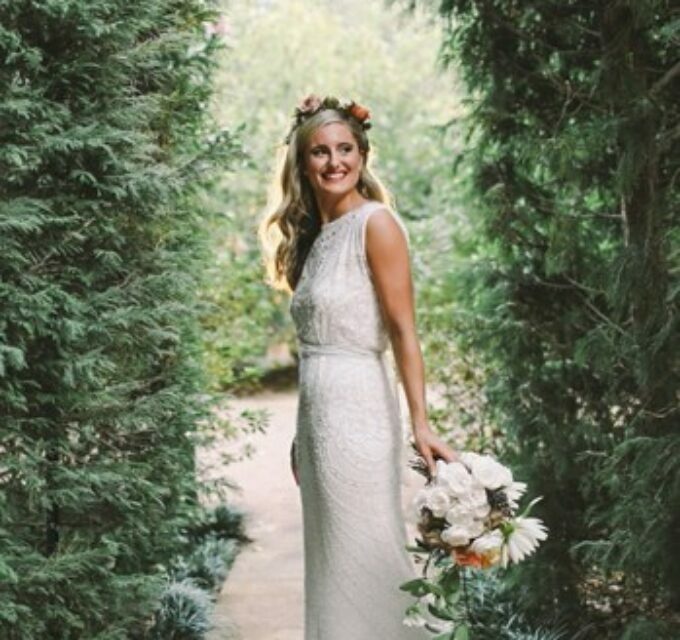 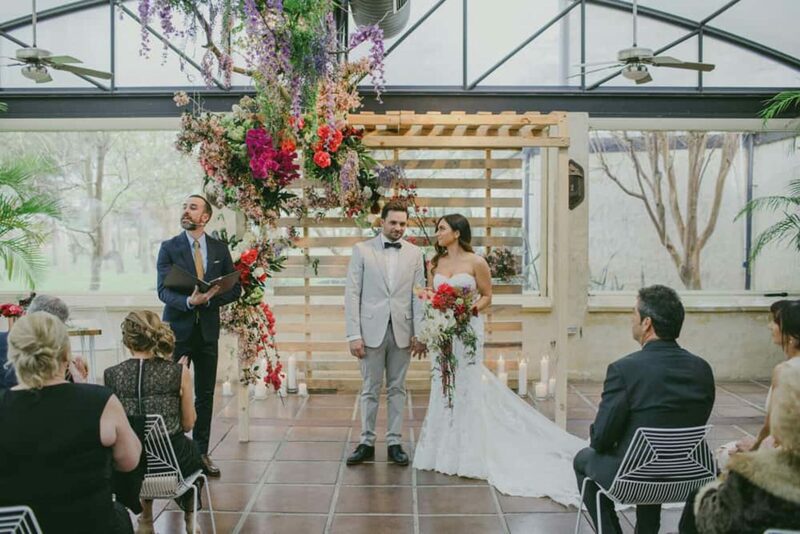 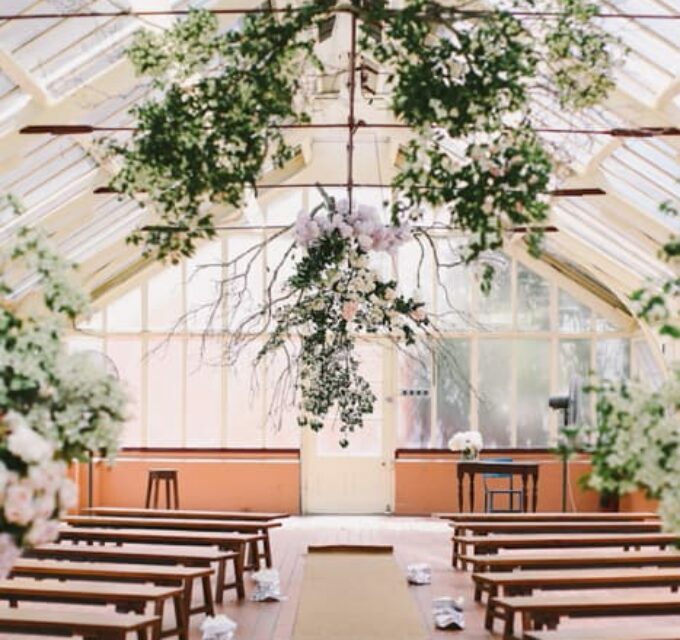 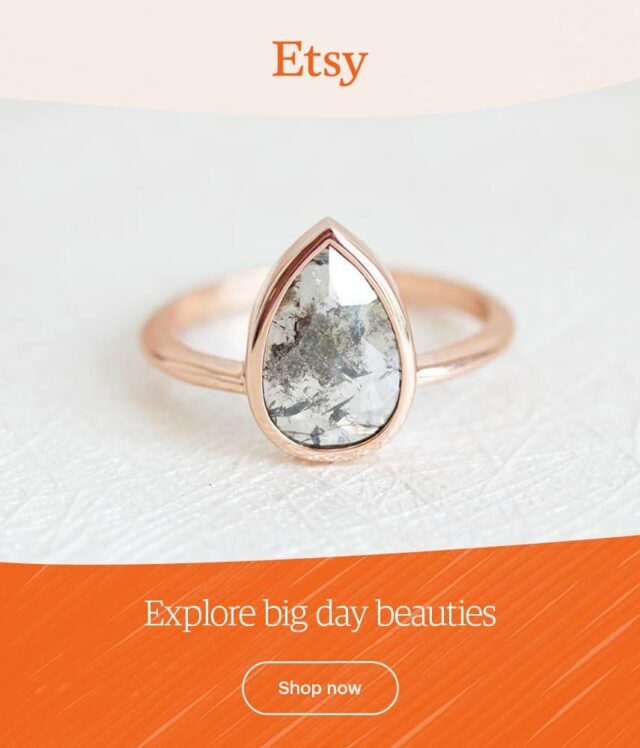 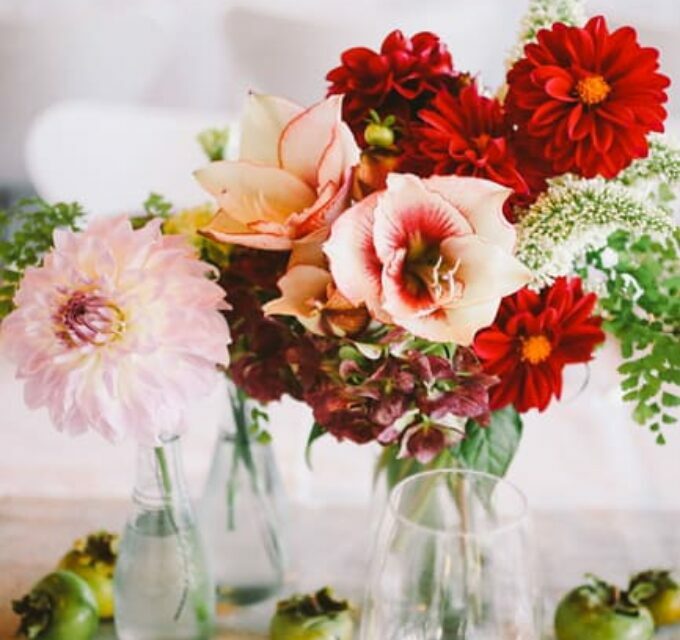 “The flowers really made each of the spaces feel like us and our style,” Danielle shares. 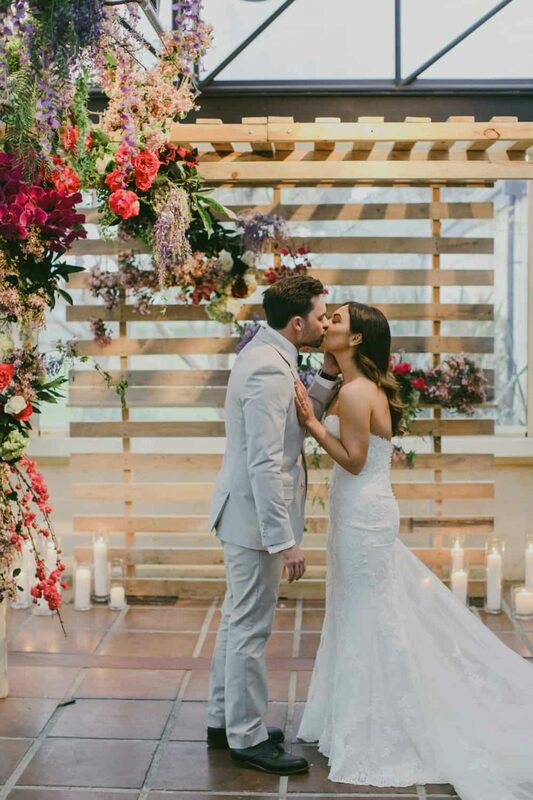 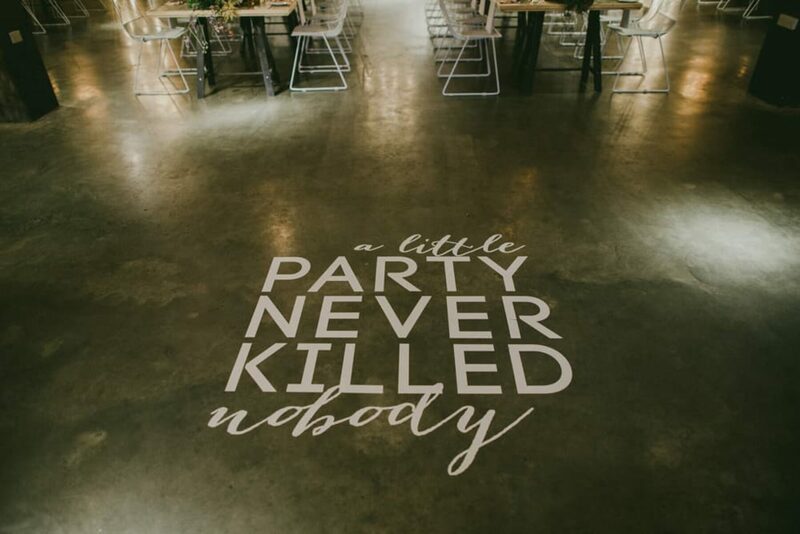 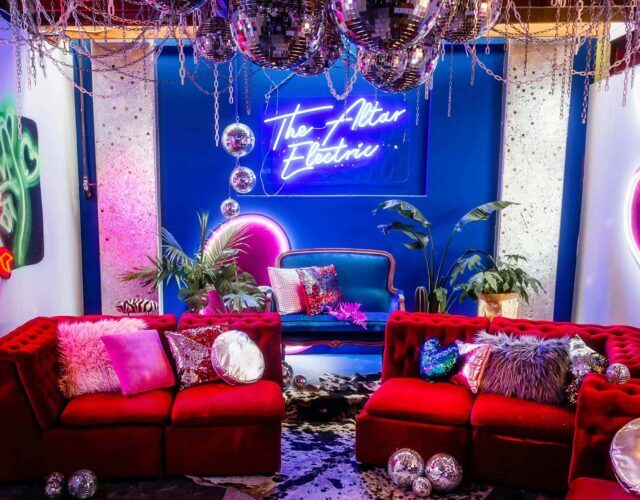 “You couldn’t help but say wow when walking into each room, they were incredible. 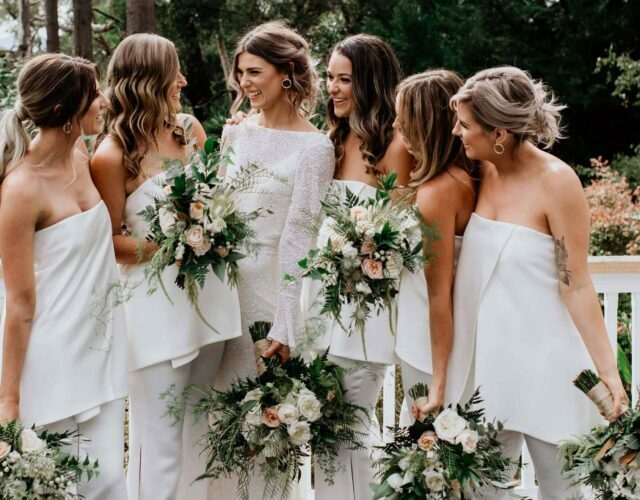 Our guests are still talking about those flowers!” With all of the effort their vendors went to, these babes were glad they had Natasja Kremers there to capture it. 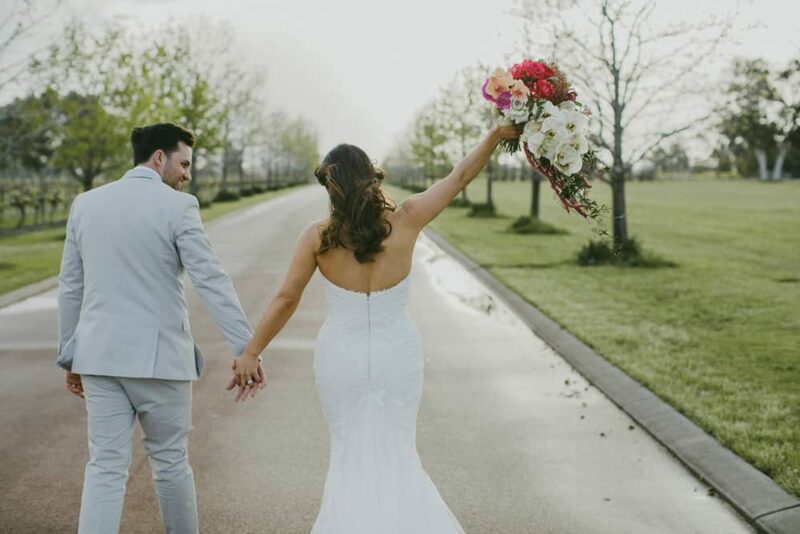 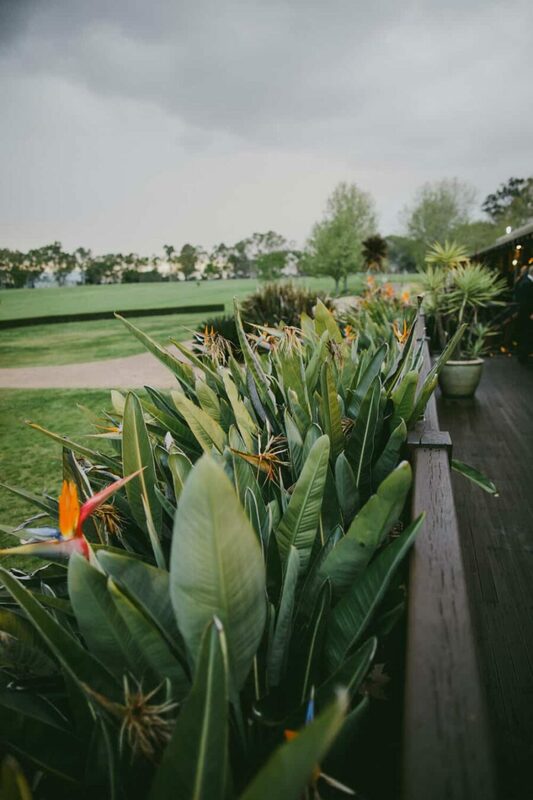 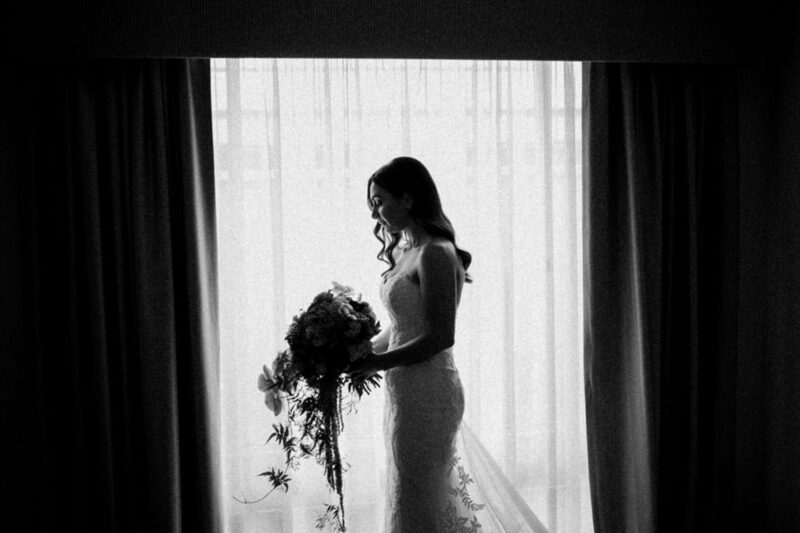 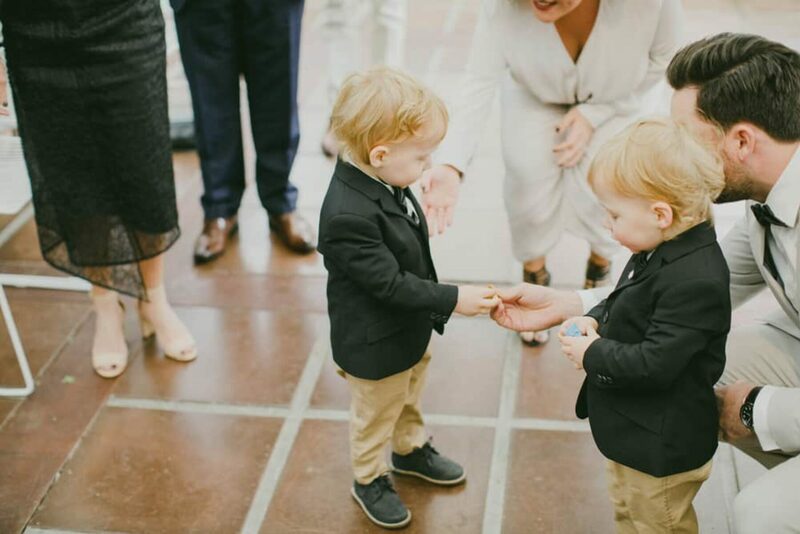 “We are in love with our images and are so grateful for how she beautifully captured our day!” After all, what’s a wedding day without lasting memories to look back on? 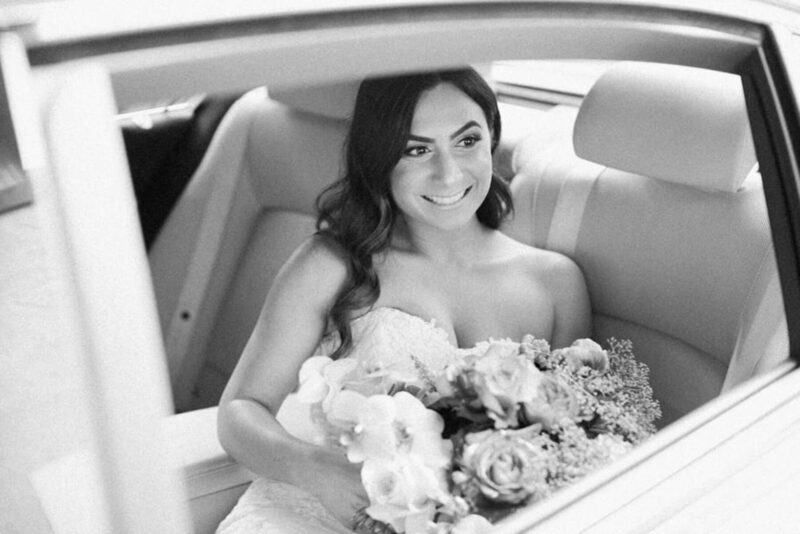 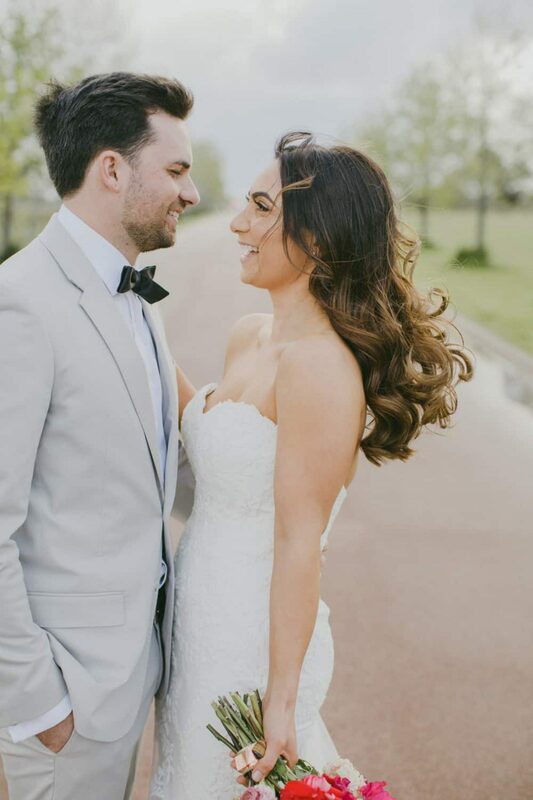 We love a sweetheart neckline and the beautiful Danielle does her strapless Enzoani number justice. 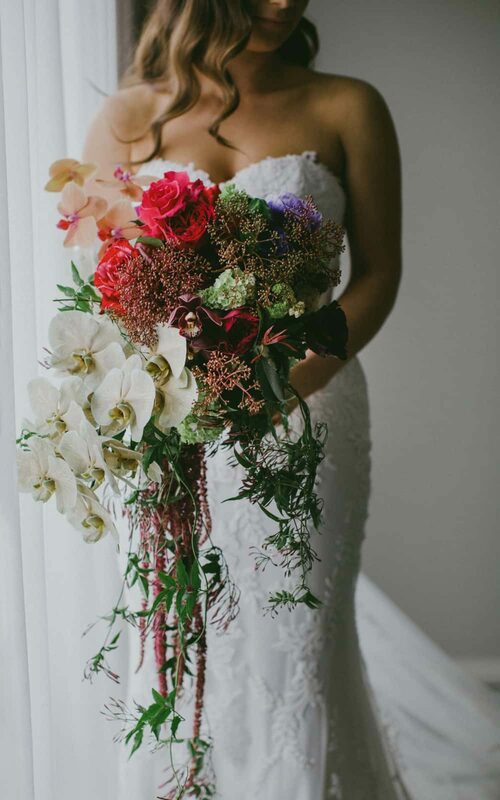 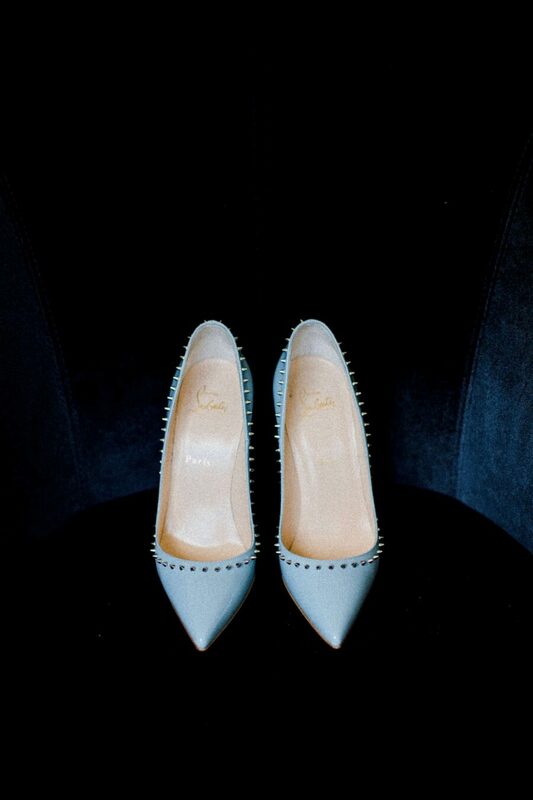 Paired with some super cool studded Loubs and an epic cascading bouquet by Natural Art Flowers, this is one stylish bride! 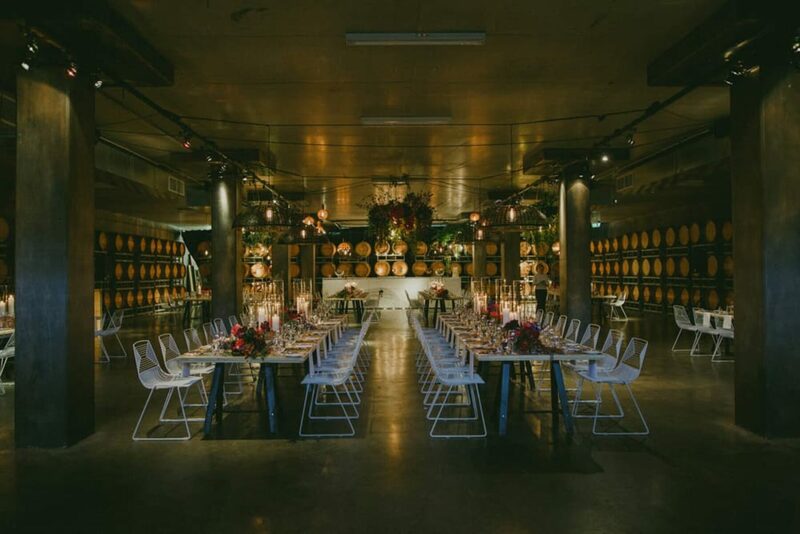 Styled by Butcher Baker Stylist Creator, the contemporary setup at Sandalford was aided by an A-team of prop hirers. 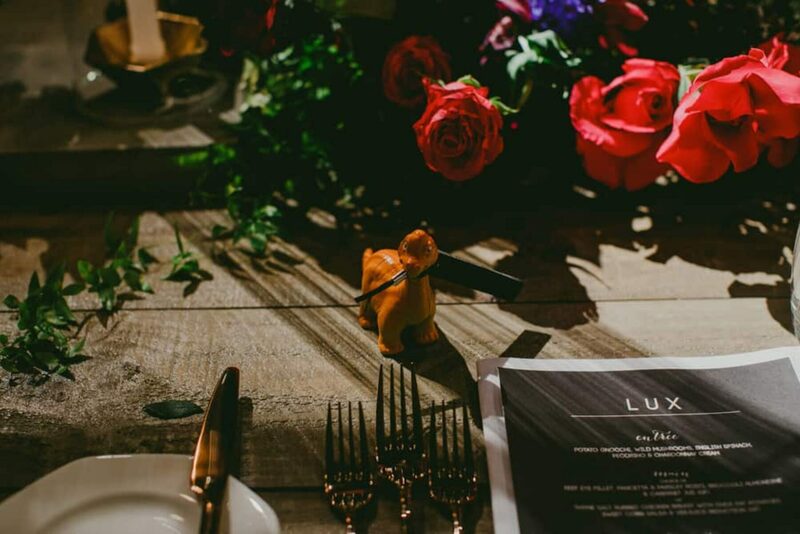 Owl and Bear were responsible for the gorg ceremony arbour, Event Artillery provided the chairs and bar, Hire Society supplied cutlery and pre-reception table and seating and Micktric Events kept the lighting on point. 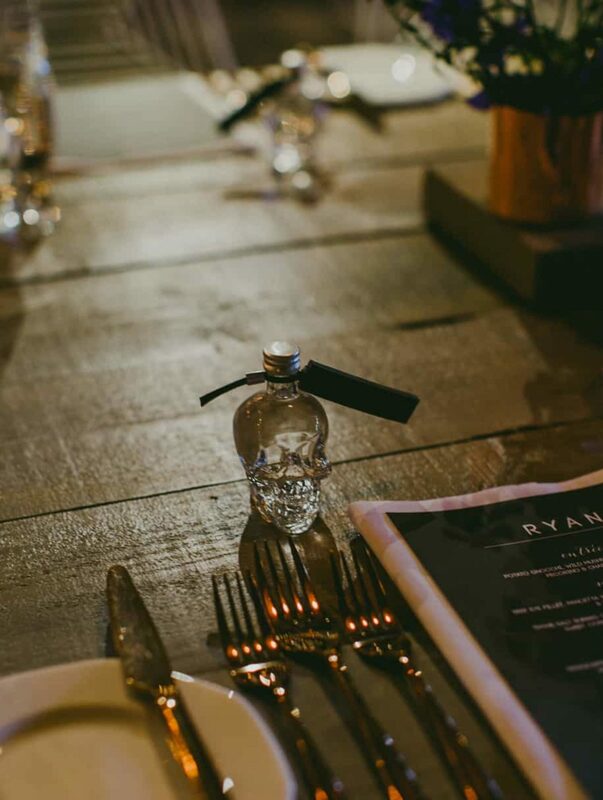 These darlings DIY’d the party favours, creating personalised labels for mini Crystal Head Vodka bottles. 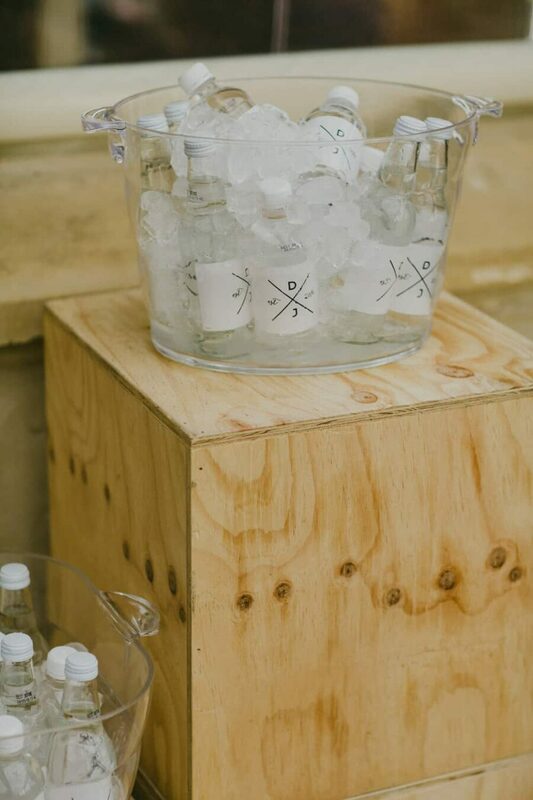 Did somebody say shots? 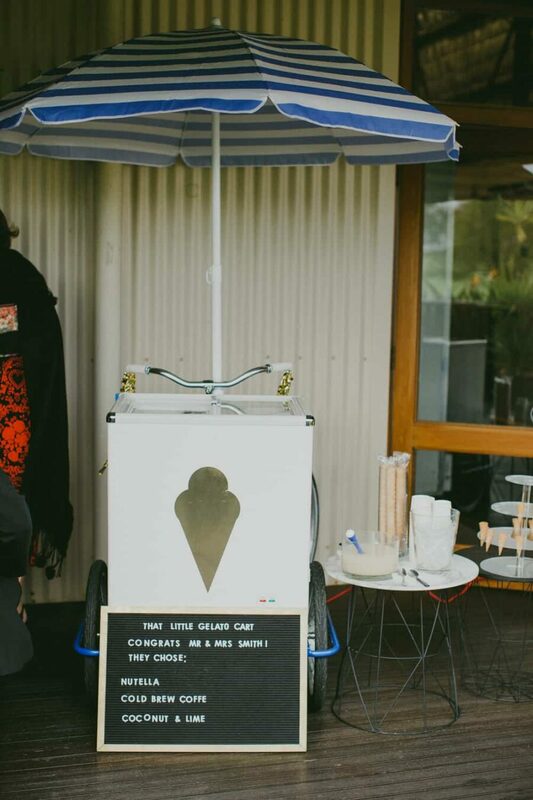 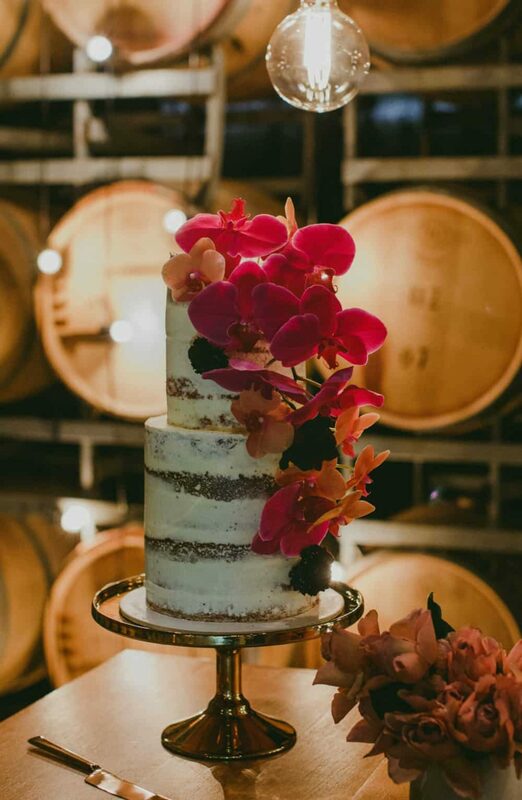 Sukar always do the most decadent treats and Danielle and Jarrad's nearly-naked cake is no exception! 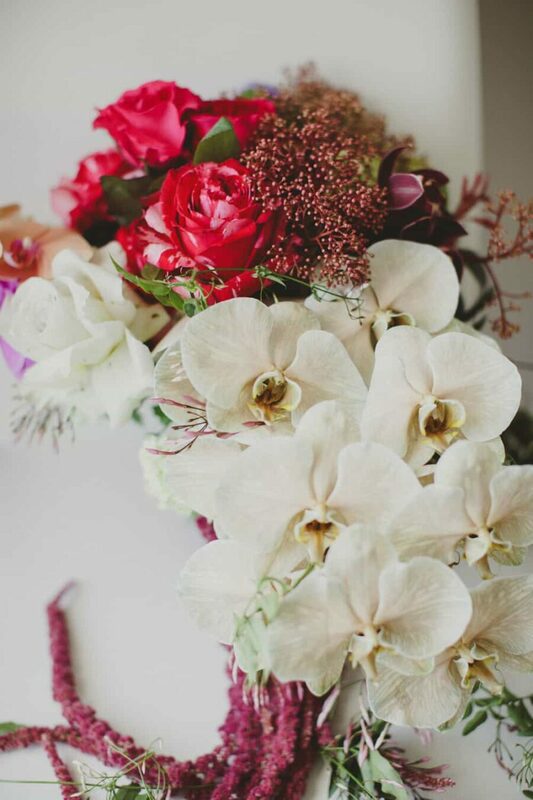 Dressed in berry-toned orchids by Natural Art Flowers, it's almost too pretty to eat.